THE FUTURE HAS ARRIVED AT YASEER RENT A CAR. For the first time in the region, Chevrolet introduces the all-new, all-electric Chevrolet Bolt EV. The Chevrolet Bolt EV makes no compromise on performance. With an NEDC-estimated 520 kilometers on a single full charge, 204 horsepower and 360 Nm of instantly available torque it will surprise you with its speed and acceleration. From 0 to 100 km/h in 7.3 seconds! 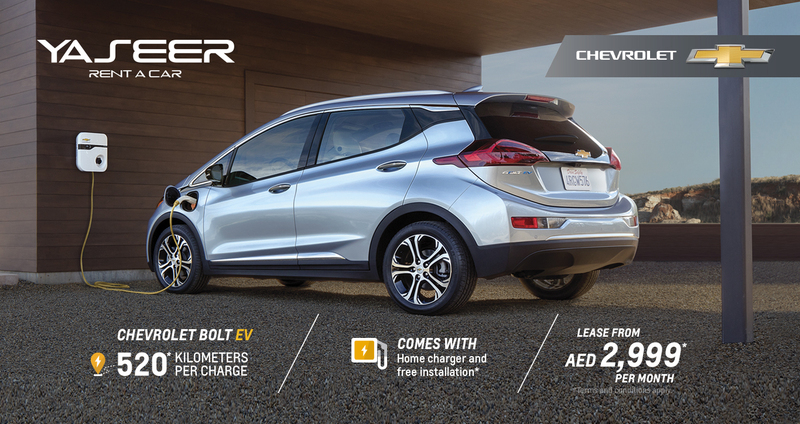 The All-New, All-Electric Chevrolet Bolt EV Starting From AED 2,999 per month.